The kimono has been a symbol of Japanese/Asian custom for hundreds of years, and also exemplifies a conservative, humble, and simple persona. It is quite different from the fit, and tight designs of the western world, but the straight lines, flowing sleeves, and pulled back collar (revealing the woman’s neck), for the kimono, can be a sensual design in itself. In the current day, kimono seamstresses are mostly veteran woman in their 70’s or 80’s. 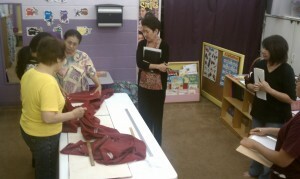 Few of the younger generation of our day care to even think of even where to get a kimono, less how to make one. With this in mind, Norman Kaneshiro, of Ukwnashin decided to offer a kimono study group, led by Mrs. Miyoko Miyashiro. Norman’s expanded idea is also to have a group of kimono makers, so that Okinawan costumes for recitals, etc, will be available. The kimono club’s first big project was seen by a sold out crown at the”Danju Kariyushi” production at the Leeward Community College this past May. They had put together a total of 24 kimono for the “Meekata” group, and for the king’s role. Besides the kimono, they also helped to assemble the traditional ufu ubi or long sash used formally by the aristocrats and royalty. To be able to pass down this art helps to also pass down our values. 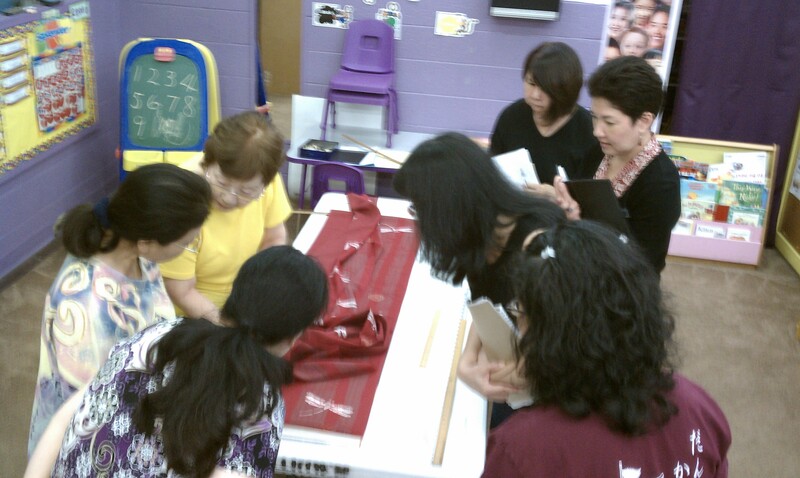 Okinawans believe that kimono is made with love and heart. This energy is passed on the the person wearing the kimono, and in many cases, is passed on from generation to generation. The stitches lock in this energy and the maker’s spirit helps to protect the wearer in their travels or as they wear the piece. In the past, when a person is laid to rest, part of the ceremony was to have family members each sew part of the kimono. After putting it on the body of the deceased, the seam of the back spine, or sometimes the sides, would be open to release the spirit to the other world. We hope that more will become interested in kimono and use kimono not only during bon dance season, but as a symbol of our identity. Okinawan textiles are a renowned treasures that needs to be brought to life through wearing them proudly, as compared to the more often seen hakama and montsuki. This entry was posted in Articles and tagged kimono, ukwanshin by admin. Bookmark the permalink.